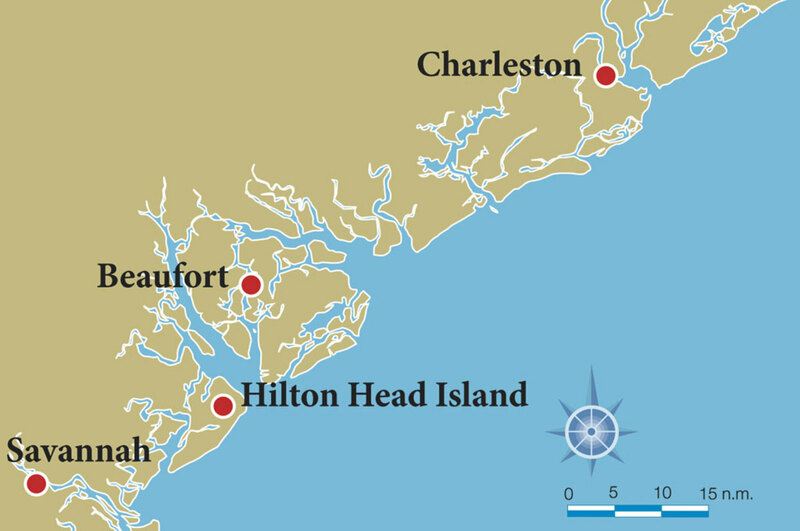 A decade ago, here in the pages of SAIL, I wrote of my experiences with the inaugural Classic Boat Rally fleet as it sailed along the Intracoastal Waterway from Savannah, Georgia, to Charleston, South Carolina. It was a six-day cruise that led the boats through some of the prettiest waterways of America’s south. Naturally, when rally founder Sam “Woody” Norwood asked me if I would like to join the fleet once again for the 2016 rally, I happily said yes. And so I found myself in the South once again this past April, with 10 classic boats ranging from 18ft and 22ft catboats to a Drascombe Lugger and Menger Oysterman 23 ketch, once again gathered to mark the 10th anniversary of the rally with a reworked three-day sail that would visit three iconic Southern yacht clubs: the Savannah Yacht Club, where the event started, the South Carolina Yacht Club on Hilton Head Island, and the Beaufort Yacht & Sailing Club on Lady’s Island, where the lucky crews enjoyed yet another round of Southern hospitality at the awards dinner. I was delighted to see that the Classic Boat Rally lived up to its reputation as a gentleman’s race. These aren’t men who quaff Pabst Blue Ribbon, chardonnay or just plain cranberry juice, thank you very much. There’s no foul language, and each evening, as they trade their dirty shorts and Sperry’s for blue blazers and long pants, there’s no difference in demeanor. It is the kind of event you’d be happy to have your daughter crewing in: civilized and competitive, but without the stress. 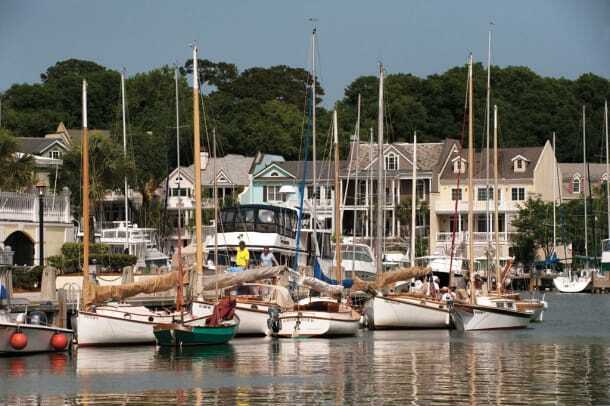 The rally consists of five races, starting with a practice race that begins and finishes at the venerable Savannah Yacht Club, overlooking the ICW. Sam Norwood, who sails Myrdie III, a Cape Dory Typhoon Senior, lays out the courses, taking into account tides, winds, boat traffic, sandbars, narrow channels and more, organizes lunches and dinners at the yacht clubs and tracks participants while calculating ratings for each staggered start. For months beforehand he also communicates the plans of the rally to participants via e-mail, and as a result, it’s no surprise how the crews laud his efforts and ability to keep the spirit of the event ever-present with his pre-and post-race commentary. At Thursday morning’s skipper’s meeting on the expansive veranda at the South Carolina Yacht Club on Hilton Head Island, Norwood reported the possibility of thundershowers. “Regardless, we’re going to proceed ahead to our destination with due alacrity,” he added, prompting many crews to start thumbing their smartphones to find the definition of alacrity. Norwood’s statement was oft-quoted throughout the day. Friday’s rain never came, nor did the first race’s wind, prompting race committee chairman Frank Pontious to proclaim Point Royal Sound as “the flattest I’ve ever seen it.”Though there’d been a light breeze in South Carolina’s Skull Creek, Pontious shortened course, with the fleet motoring across Calibogue Sound. Fortunately, the afternoon’s final race was blessed with an onshore breeze that had spinnakers flying and sails filled in 8 to 10 knots of wind. SAIL readers have learned much about the joys and challenges of sailing the ICW through the coverage of this magazine’s ICW Snowbird Rally over the last two years. Though I am being biased when I say that springtime in the Low Country is without equal, as bright green marsh reeds spike through oozing brown mud, white shell banks at Calibogue Sound glitter at low tide, and migrating birds beg your eyes to turn from luminous waters shoreward. But despite the natural beauty of the ICW in the spring and the joy of knocking about in small boats, what really makes this event so special is the people who make up the fleet. Norwood has a great passion for sailing, adventure and detail. A former corporate wonk in financing, development and planning, he’s currently writing a book on entrepreneurial finance. He also has a certain je ne sais quoi as a result of world travel, and an ancestry dating back to the 1600s when various Norwoods populated Virginia and Massachusetts. Among Norwood’s old friends in this year’s rally was Frank Pontious, who, in addition to serving as PRO for the rally, is chairman of the Beaufort Yacht & Sailing Club Board of Directors and a US Sailing regional race officer. Randall Swan was another long-time friend at this year’s Rally, his second. As teens, Randall and Woody raced Snipes in Charleston. Swan, 77, is a retired fourth generation Charleston Harbor pilot who sails a Drascombe Lugger, Tortuga. At this year’s rally, he sailed with Bob Achurch of Beaufort for the first two days, and then with his wife, Nancy, on Friday. Bob and Nancy have sailed together 40 years; he’s sailed with Swan for 60. “We’re too old to be sailing in an open boat in a distance race, but it’s in our blood,” laughed Swan. “I like the rally because it’s a point-to-point race/cruise with different host clubs and venues nightly. The fellowship is great among a bunch of small classic boat nuts.” Classic boat nuts, indeed. At the award ceremony, Budd was presented with the “Bunky Helfrich Award,” which recognizes the rally participant “who surmounts the biggest challenges, with persistence and good spirit.” The award is named for Carl Paxon “Bunky” Helfrich, the Savannah sailor and Norwood chum who worked and sailed with Ted Turner in the America’s Cup, waging a “heroic battle” fighting leukemia. Budd, currently battling cancer, was “a fitting recipient,” said Norwood. A few days earlier, the St. Louis men were among a handful of sailors attending a casual pre-event cruise to Savannah with a raft-up at sunset near the Wright River at Field’s Cut. Once there the evening was spent enjoying food, drink, sea stories and then the quiet anchorage, the peace of the scene broken only by the calls of Eastern Whip-poor-wills, and the ubiquitous annoyance of no-see-ums. Andy Fishkind, the owner of a Bluffton, South Carolina, contracting company and also a chef, supplied the evening’s grub with the help of a giant cast iron Dutch oven, his specialty. Fishkind, 55, is a lifelong sailor who was sailing his Marshall 22 Catboat, Fair Ellen, for the fourth year with crewman David Prior. “Just being with friends with a like appreciation of classic sailing designs and practices is refreshing, not to mention very pleasing to the eye,” said Fishkind. The other Marshall 22 catboat, True Love, belonged to LeRoy “Roy” Crocker, a renowned South Carolina sailor who has made a name for himself on the scene since retiring in 2004 with his wife of 53 years, Carol, who regularly sails with him. After competing from 2006 through 2009, Crocker returned to mark the event’s 10th anniversary with crewman and retired plastic surgeon, John Kenny. Also on hand for the event’s 10th anniversary was Savannah native Buddy Sharpton, 66, and his crew Sonja Wallen, 50, racing Sharpton’s Harmony 22, Three Part Harmony, which he’s customized with 170lb of wraparound ash interior. 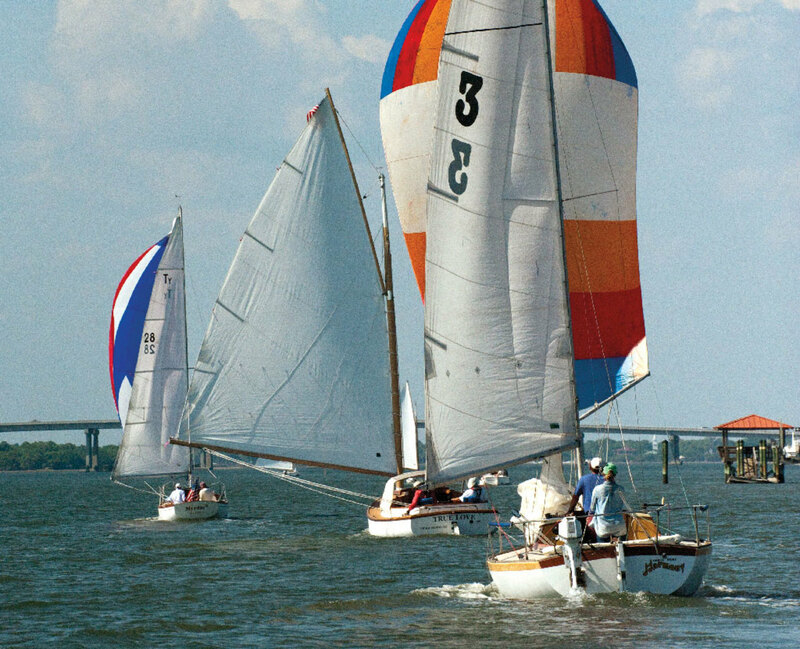 In his seventh Classic Boat Rally since 2008, and first with this boat, Sharpton said his favorite moment was the nine-mile spinnaker run in the last race after the zephyrs from the first couple of days were replaced by an offshore breeze from the southeast. This was not only Day’s first Classic Boat Rally, but he nailed the victory sailing a newly acquired Marshall 18 Sanderling, Oxygen, that he’d only purchased in December. “This is the first sailing race I’ve participated in where running aground is so much in your thinking,” laughed Day. Day secured the overall win by finishing first in three of the five races, with second place going to two-time Classic Boat Rally winner, writer and solo sailor Bill Cheney aboard his older Marshall Sanderling 18, Shorebird. Sharpton and his 1970s Harmony 22 finished in third. 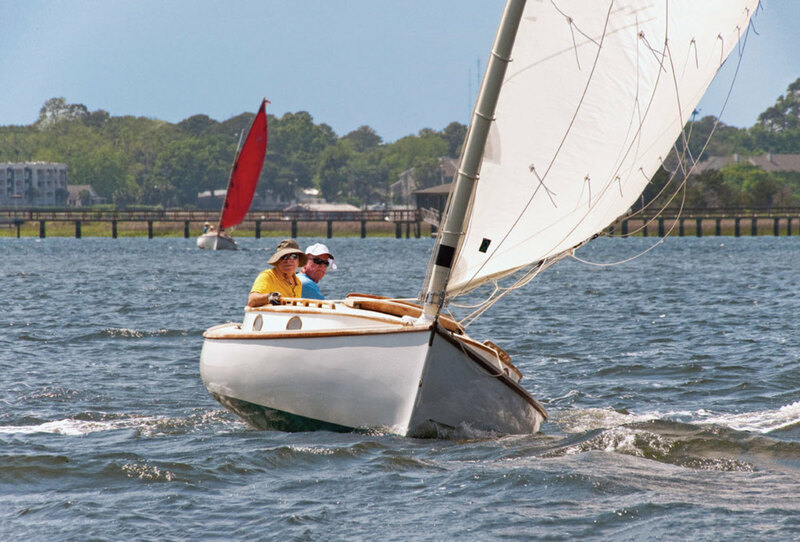 “I have always liked catboats and find they’re the perfect craft for the Lowcountry,” said Cheney, 75, who started racing the Classic Boat Rally in 2012, taking second place his first year, and then going on to win, first in 2013 and then again in 2014. Classic Boat Rally regulars, like Sharpton, said they were already marking their calendars for the 2017 event, even as the 10th running was still fresh in their memories. For Norwood, it’s a reunion heartily anticipated. Soon after the rally ended he was towing his beloved Myrdie III to Florida in order to solo-sail the 400-plus miles back to Beaufort. “I sail, therefore I am,” he says, rephrasing René Descartes.